Quest Controllers: Your Smart Eyes and Ears at the Substation and Remote Site. Quest offers both monitoring equipment and software solutions for Utility Substations and Remote Sites. With the rapidly changing CIP requirements, Quest products and software assist you to step up your cyber and physical security monitoring to meet CIP requirements. Quest applications include full environmental monitoring, power monitoring including Commercial Power, DC Plants, BDFB, Inverters, Generators, ATS, UPS, Power Meters, and Electrical Distribution Panels, and tower light monitoring. SNMP traps/gets are sent to NOC’s and email alarm messaging sent to MSO Staff. Quest developed OspreyFMS Enterprise Software for monitoring assets and mapping multiple sites in one user-friendly enterprise tool. OspreyFMS’s easy-to-use Dashboard enables Power Utility staff to easily and quickly interface with multiple substations and remote sites from one central server. OspreyFMS supports open protocols such as DNP3, Modbus, SNMP and BACnet and is centrally hosted to allow back and forth communication with other networks, applications, and servers. It offers several levels of security to meet CIP standards. OspreyFMS is a versatile monitoring solution that provides extensive status checking, trending and a suite of analytics tools for all Critical Infrastructure Equipment, including high to low impact assets. This tool is highly scalable to each Power Utility’s footprint, from small to large, and very affordable. OspreyFMS is designed for multiple Utility users from the NOC to Telecom, Technical Operations and Engineering Staff. OspreyDCM was designed for users to quickly and efficiently monitor large volumes of power equipment through a refined intuitive interface. OspreyDCM hosts a robust set of features for unlimited monitoring and alarming of PDUs, DC Plants, UPSs and other SNMP communicating critical power equipment. OspreyDCM’s customizable dashboard rolls up data from the building level down to the outlet, personalizing metric delivery for each user. Auto-discovery tools facilitate connecting directly to power systems and commissioning within minutes. Configuration options for refining settings and alarm points contribute to OspreyDCM’s seamless onboarding. In addition, OspreyDCM provides a suite of drag and drop tools for designing graphical representations of buildings and elevations for racks and rows down to the individual PDU. With ever-increasing workplace demands, it is paramount for power monitoring deployments to be swift and flawless, alleviating workloads and increasing productivity. Additionally, advanced alarming features of OspreyDCM provide multiple tiers of data management and an unlimited number of alarm conditions including multi-site event criteria. Options for SNMP Trap filtering as well as utilizing OspreyDCM as an alarm poller are available. Quest Controls developed OspreyDCM focusing on the end-user’s experience and that includes providing customized messaging and real-time critical data delivery through the OspreyDCM Android and iOS Apps, making power monitoring effortless. TELSEC® MP2 supports DNP3 over serial and ethernet for status of monitoring points. The MP2 has 32 universal inputs which support monitoring temperature, contact closures or any 0-5 VDC or 4-20 mA sensors. Two RS485 serial ports are available to monitor Modbus RTU enabled devices or act as a DNP outstation. The system features a built-in web server for programming and status monitoring of the site, including a historical graphing engine. The alarm logic is programmable with multiple severity levels and all programming is stored in non-volatile memory. The MP2 has Ethernet communications with support for IPv6, IPv4, HTTP, HTTPS, RADIUS Password Authentication, SNMP v1, v2c and v3 and SMTP (Email) and is easily integrated into Quest’s OspreyFMS® network management software or any third-party NMS. The RSC 1000™ is a technology leading energy efficient HVAC lead/lag controller on the market today. The RSC 1000 can be remotely managed across an IP network using standard IP network protocols, SNMPv1, SNMPv2c and now SNMPv3. Combining the RSC 1000’s existing IPv6 addressing and HTTPS secure browser access; the RSC 1000 operates to current CIP security standards. The RSC 1000’s color touch screen interface provides simple onsite management of HVAC systems, allowing total control of the AC units. The RSC 1000’s browser interface is user-friendly and easy to use. 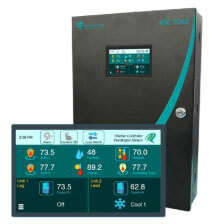 The RSC 1000’s advanced control logic allows the RSC 1000 to “learn” and automatically adjust to optimal HVAC settings for energy conservation and HVAC equipment longevity. All RSC 1000 sensor input status levels are available to any SNMP capable management system or remote field technician for analytics and trend reporting. Beyond the sophisticated HVAC controls, the RSC 1000 includes Modbus RTU Communications—Support communications to Modbus RTU enabled equipment such as KW meters, generators, fuel level sensors systems as well. Improved onsite controls and remote access to review the system’s performance reduces truck rolls for standard and emergency callouts. Field techs improve productivity and site coverage by implementing intelligent remote management of the Substation facility. Combining the new RSC 1000 ACX Expansion Module, the RSC 1000 controls up to four air conditioning units for cooling, heating, vent and economizer.